This is the most important part of Real Estate Investing. Have a written plan. Write down your target purchase price. Get familiar with actual sale prices in the area. Always do a quick market analysis before submitting an offer. You have to know how much the rehab will cost. If time allows get a written quote. Know all the costs, fees, taxes, everything involved. You can use an inflated figure to estimate. A Real Estate Agent should be able to give you a basic idea on this. On a normal purchase of $60,000 and resale of $100,000 I typically use an estimated cost of $10,000 for commissions and fees. Based on the home and time of year, this may also cover a portion of taxes. Add to this the cost of improvements, loan costs, and any city charges, a targeted profit of $10,000 is about standard. This is why it is so important to write everything down. Create a form or simple spread sheet. Keep records and learn from failures as well as from your success. How do you avoid hard money scams? A wise teacher once told me, he never asked a question without first providing the answer. Here is a list of things to look out for. Bad advice which is designed to appear free. Avoid high up front fees. This is exactly what Internet scam artists in the hard money market thrive on. A fee for this, that and the other thing. They want you to invest, then they have you hooked. It is the oldest trick in the book. Do they really have a book? You better believe scam artists have a written step by step procedure to get you to send more and more money. Look at the scams where they tell you they will transfer millions of dollars to your bank account. They don’t have any money, just a long list of promises, excuses and fees. This is why it is so important to have your own written plan. Look at it as preparing for battle. Scam artists know you do not want to loose money and target that emotion, reading off a list of promises to get you to send more money. Don’t let them turn this into an emotional mind game. Stick to business facts. 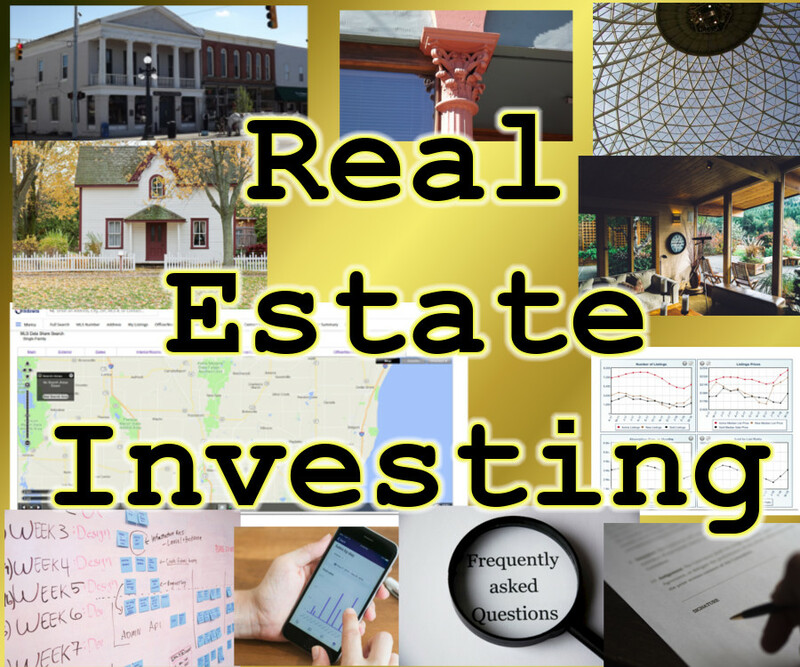 Beware of anyone claiming to be an expert in the field of Real Estate investing using simple terms putting the entire Real Estate market in a single basket. Any experienced Real Estate Agent will tell you investing and investigating is on a block by block basis. In the past three months I have identified areas in Wisconsin which have doubled in value while a few miles away values are still declining and everything in between. Anything outside a 4-6 block radius can be misleading information. If a company charges for a list, use your head and finger. Leave the site. Especially sites with tiers like basic, expert, elite services. Come on now. If I was standing in front of you as a licensed Real Estate Broker and I asked you what level of service you expected, would you work with me knowing up front I was not going to provide you with the best service I am able to provide? How would that make you feel? Does writing it out and posting it on a web site make it any different? Let me tell you a little secret in the Real Estate industry. Every Agent will tell you 80% of their business depends on return customers and referrals. Why would I give up 80% of my business which is in fact FREE advertising to make a few extra dollars? Get real. Slow down and examine the facts for what they really are. Experienced lenders know their contracts, just like experienced Real Estate Agents know the major questions to write an offer to purchase. A legitimate lender will know the usual fees and conditions of a loan. A scam artist will change the subject, tell you how much you are going to make, do anything to keep you off balance. A nominal application fee is normal, but you need to see something in return. Ask for a standard contract in advance. See what they say. If they cannot explain it, time to begin paying closer attention. E-mail them a list of questions and examine which they prefer to answer and how. One thing I have seen that is consistent with hard money lenders who never close is their phone etiquette. It does not matter what type of loan you are getting, FHA, conventional, or hard money. If a lender has a difficult time returning calls, it can only get worse. I have seen this happen a few times, the result is always the same, delays in the entire process. Lenders have to complete certain tasks on a particular schedule. With few exceptions, I have seen a direct correlation between lenders success on the phone and the entire loan process. Some of the on line Real Estate hard money lenders I have dwelt with never answered their phone and never came up with the money to close. The result is always the same with you the Buyer holding the bag. And you know what it is filled with. If you want to invest in the Wisconsin Real Estate, I may be able to help. I’ve worked with hard money lenders, found them properties, listed and sold properties for them and also work with a local lender to arrange loans. If you want to explore this market, feel free to contact me. As with everything else, it does take money to make money. If you are a new investor, 10 to 20% down from your own funds is not out of the ordinary. You also have to show cash funds to complete repairs. Having a written plan will help. It is a simple process that takes a while to build, but can and has been done. Hopes and dreams may be great, but don’t plan on wasting peoples time by not putting in the required effort on your part first. But putting in your time and effort can save you a lot of time, headaches and money in the long run.